I’ve been experimenting in the ambient/downtempo genre a bit. The song just cuts out for now. Still lots of work to be done on it! Epic Games released Unreal 4 for $19 a month and Crytek has announced $10 a month for use of the CryENGINE. Hopefully Unity will take note of this and reduce their monthly subscription cost. Even so, great things are happening in the world of game development! I predict that the next 5-10 years are going to be a new golden era for gaming. I think we’re going to see rapid changes to the design patterns we’re all used to seeing for years now. I can’t wait to see what the next decade brings! I’m currently taking an Introduction to Discrete Structures course at the University of Arizona that introduced me to PROLOG and after learning the basics of that language I decided I wanted to give functional programming another go. This time, I actually have got something working. Unfortunately WordPress doesn’t have syntax highlighting for Haskell specifically, but it at least highlights certain keywords. EDIT: I’ve updated the code with type-definitions and removed some redundant parenthesis thanks to a some helpful redditors. The source code is viewable on Github here. New update for Super House of Dead Ninjas Coming Soon! Pretty sweet news, in my opinion. I enjoyed the hell out of that game but my one complaint was that it was a bit short. Having widescreen support will definitely be welcome as well and will help to detract from the “flash game” vibe that I get when playing it. After reading about others’ development strategies for the 2013 7DRL I stumbled upon a post by one developer who mentioned off-handedly using Wang tiles for the level generation in his game. Naturally, my interest was piqued as I have always been interested in procedural generation and never had heard of this concept before. After searching I found a rather sterile Wikipedia entry followed by this rather useful article on the topic. The core idea of Wang tiles is that as long as all the edges of each tile in a tiled surface match the edges of their neighbors the tiles will appear congruous and can be used to add complexity to a texture or game easily. Interestingly enough, it’s also easy to generate an entire grid and fill it with Wang tiles. You can place the tiles row by row and you only need to ensure each new tiles’ connected edges match the tiles already laid down above and to the left of it (if those tiles exist.) Otherwise, you can use any tile in the set. 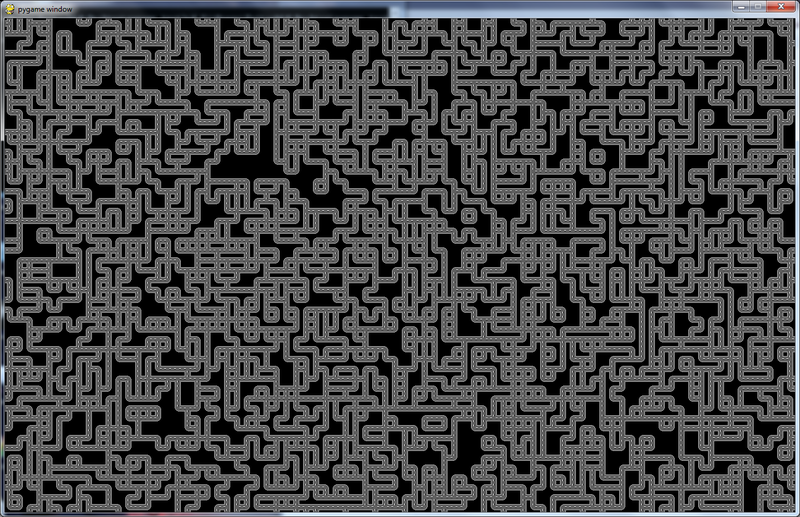 I decided to implement my own Wang tiles system using pygame. As you can see, the implementation is straightforward and allows for easy expansion for adding more side-types (currently having two: closed or open.) I’ve added a snippet of the resulting image generated by the program below. Wang tiles are a very interesting, and simple, concept. I’m glad I discovered them as I’m sure I’ll put them to good use in the future! Well, Day 7 has come and gone and I’m glad to say that I have something playable at least. It’s not the most fun and is mostly luck based but it’s something. I may keep working on this game anyways (especially if anyone likes the game or at least the vision behind it.) It’s a very simplistic completely text driven game. Some key features: menu system, limb simulation, detailed text based combat. My thoughts on why I wasn’t able to complete a more advanced game in the time-span are detailed in this post. I would definitely like to compete in a future 7DRL and I will likely compete in the upcoming LudumDare so I have that to look forward to! The game (which is also the source, thanks to Python) is available for download here. You need to have Python 2.5-2.7.3 (2.7.3 being the version I used to develop the game) to be able to play. I tried to get Python 3 compatibility working however Unicurses would not cooperate with me and I didn’t have enough time to try to figure out why. If anyone needs help getting the game to run feel free to post a comment to this post and I will help you as soon as possible.